The ruglet Lean is well underway. Once the wool fabric is dyed, my main aesthetic decisions have to do with the direction of the hooking. 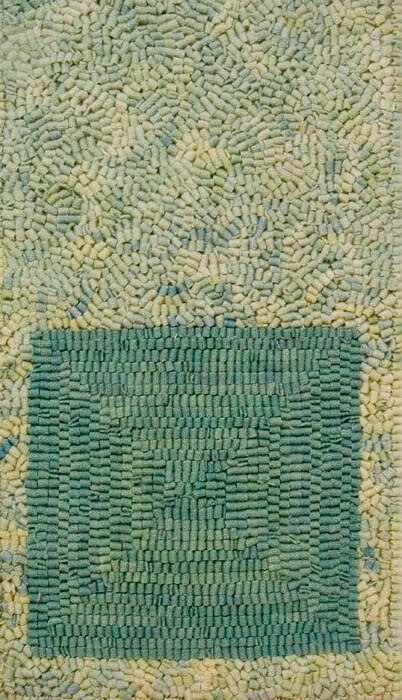 I decided to hook the vertical rectangle by following its four sided outline, from outer edge till the hooked rows met in the center. I felt that this made the form seem more solid––a thing to lean on––than it would using parallel vertical lines. 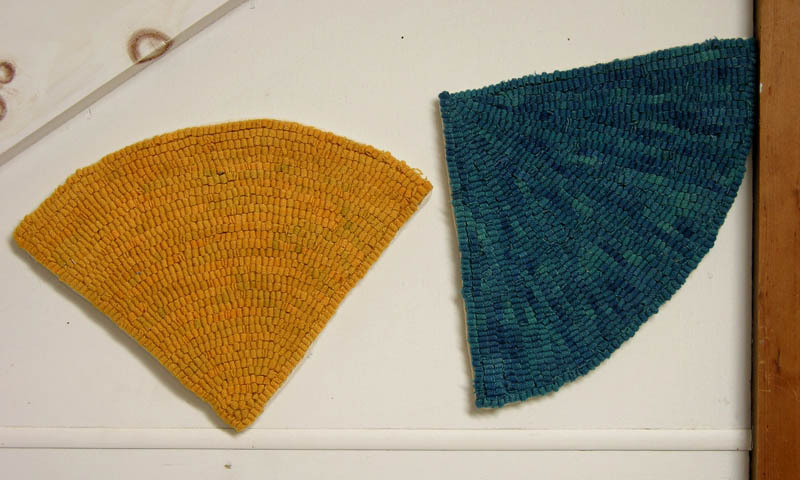 After outlining the green form, I tried using a random hooking pattern, but didn't like it, realizing that the shape needed to be emphasized by following its outlines. I'm still not sure how I'll hook the reddish background; it'll be either random or horizontal, to contrast with the strong vertical. 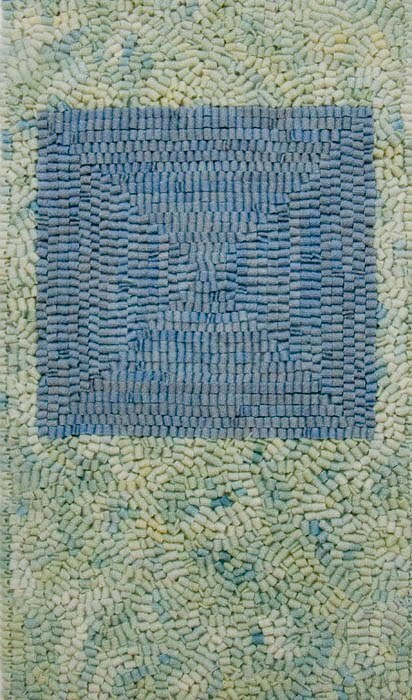 I always enjoy looking at a ruglet at this stage of its making, with lines of wool creating a strong simple image against the neutral linen background. 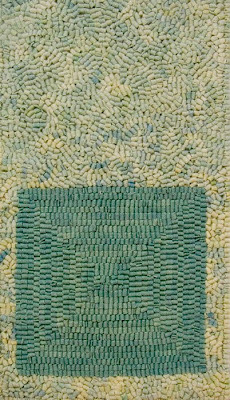 I've often thought of how I can use this for other ruglet designs, with line and shape playing against each other. 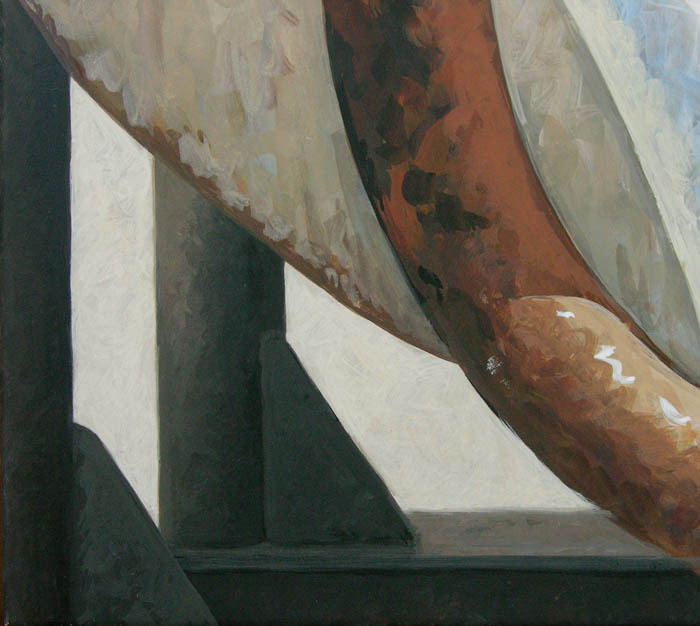 In 2006 I did the piece below, inspired by just this element in the hooking process. After doing the underdrawing in ink for this painting (shown in an earlier post), I began to lay down several layers of color, and at the same time refine the drawing of the forms. The biggest change I made in the drawing was to make the curve of the rusted pipe more gradual, instead of close to 90 degrees. I felt that it made the form graceful, and the small negative space between the two pipes, white and red, became an elegant symmetrical eye. 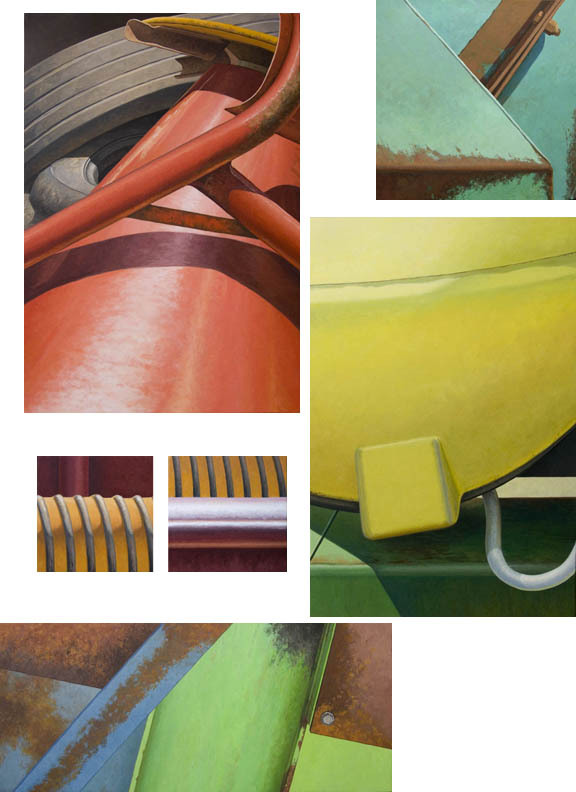 As I've worked on this painting, I realize that one of the things I like most about the image is the contrast of the volume of the cylindrical pipes against the flatter––though not completely flat––circular background and the flat black square on the upper right. In the image below, you can see that I then worked on the black cylinders with their triangular extensions and the light space behind them. For that space, I scumbled lighter tones over the slightly darker ones you see above, leaving some darker areas to give some life to what could look very flat. I left the brushmarks showing on the black cylinders, again to make them lively. 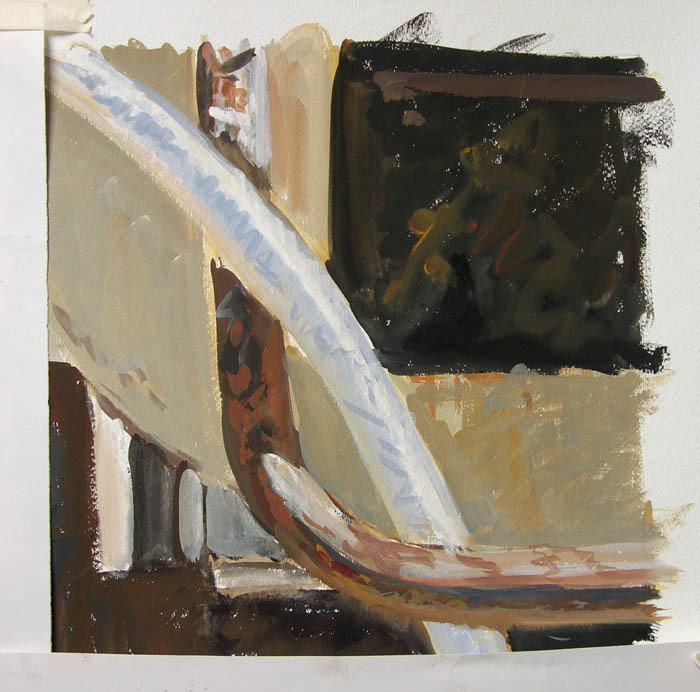 In this photo you can see an interesting juxtaposition between the sketched in volume of the rust-red pipe and the finished black ones; there's always a balancing act for me in the realism/painterly continuum. Walking the same paths day after day, year after year, never becomes dull; there's always a new inflection of light, a new object seen, a slight change to notice. Occasionally, because of the time of day, or the turn of my head, I see something startling that once seen, seems utterly impossible to have missed. 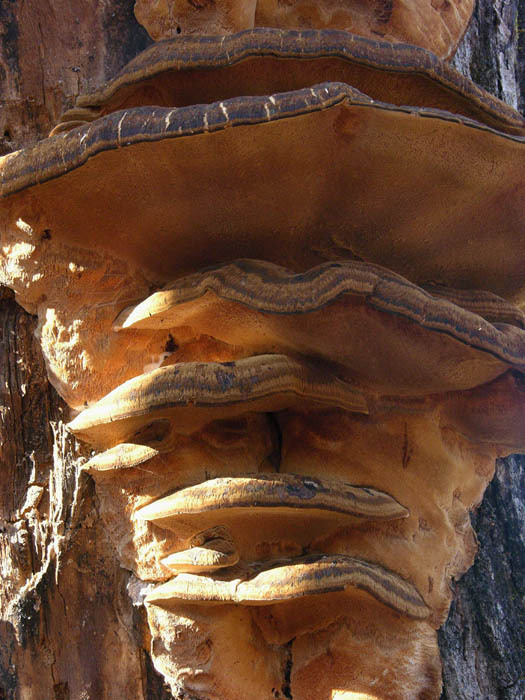 This happened a couple of days ago when I glanced at a large tree that seemed to have many shelf mushrooms climbing up its trunk. I clambered up to the tree and looked up and down, muttering "holy mackerel" and other assorted exclamations. There was a skirt of overlapping mushrooms around the base of the tree and many groupings of undulating shelves ascending its trunk, transforming the tree into a fanciful sculpture. Today I am tasked with dessert for this afternoon's Thanksgiving dinner. I just put a raspberry pie in the oven, made with frozen raspberries from this summer's crop. 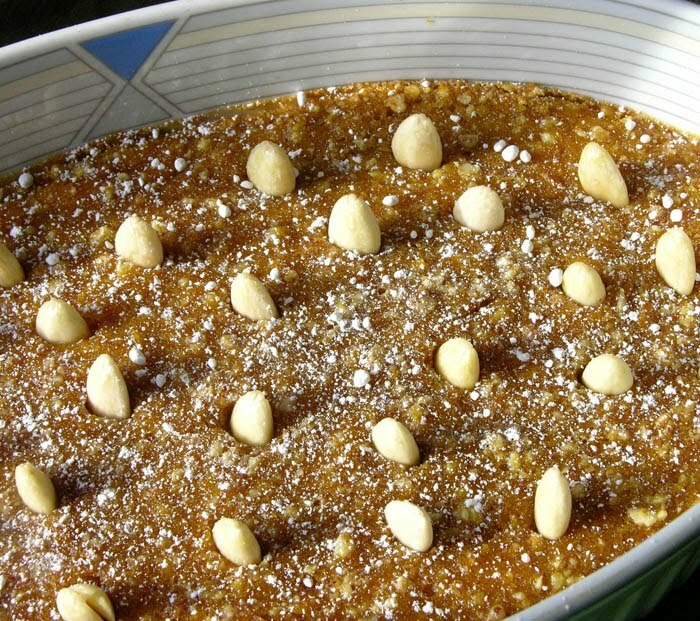 But what would Thanksgiving be without a dish made with pumpkin? Instead of another pie, I made a dessert, found in Claudia Roden's Mediterranean Cookery (sadly out of print) that is from Valencia and is called Arnadi de Carabassa. This recipe is said to be very old and of Arab origin. Its main flavors are pumpkin and almond, with a zing of lemon. If using a whole pumpkin, slice it in half, scoop out seeds and fibers, brush cut sides with vegetable oil and bake, cut sides down, on a cookie sheet in a 400º oven till tender; this takes generally 45 minutes to an hour. 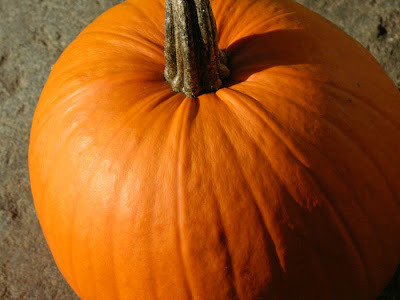 If you are using large pieces of pumpkin, put them in a baking dish and cover with foil and bake till tender. To remove any excess moisture in the pumpkin flesh you can mash it in a large pan over medium heat for a few minutes, turning it over several times. Beat the eggs with the lemon rind, cinnamon and sugar and mix in ground almonds. Add mashed pumpkin and mix well. Place in a large ovenproof dish. Bake in a 300º oven for an hour, till it feels firm and is lightly colored. Place blanched almonds point up in the dessert and dust with some confectioners sugar. The wild turkey population in Vermont has rebounded robustly. I see flocks of turkeys all the time, marching and pecking their way across the fields and woods in a very entertaining (to me) fashion. 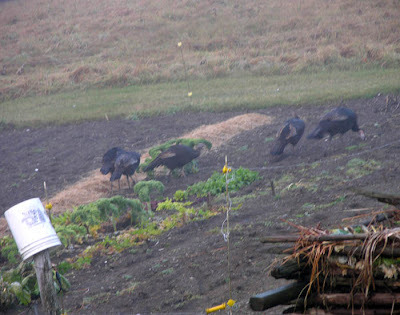 They're also quite wary birds, and fly off quickly when feeling threatened; this led to a lousy photo shot from indoors. But I wanted to have a tribute to the "pardoned" wild birds, native to America, which in their domesticated version have become the centerpiece of our Thanksgiving tables. I wish you all a wonderful day, a bounty of friends and family and good food. 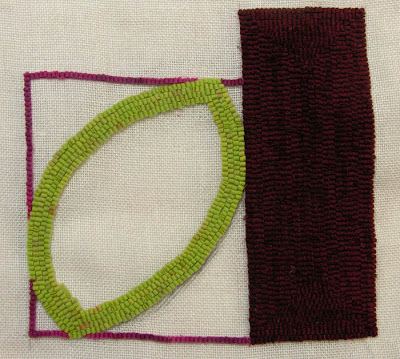 I've just started a new ruglet, using the watercolor above as the color study. 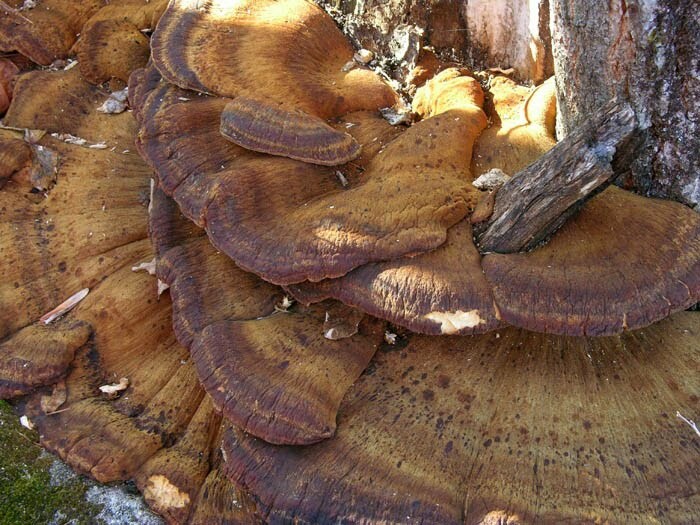 It will be 12 x 12.5 inches and be slightly shaped, with the brown rectangle rising above the rest of the image. 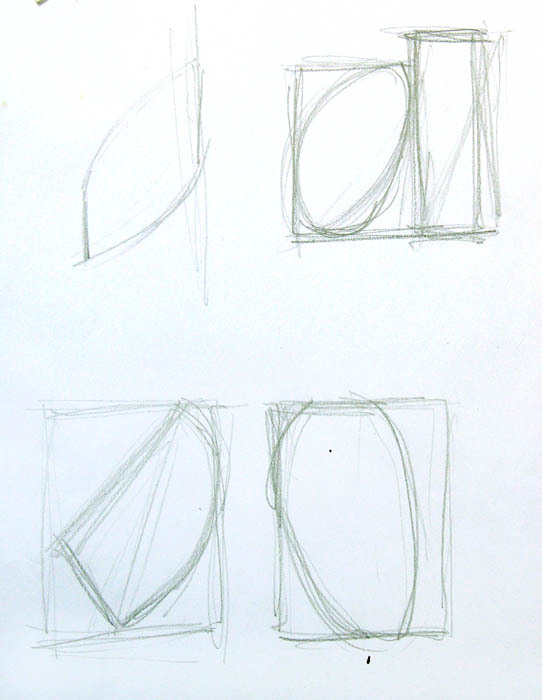 The idea for this design came from looking at the diptych Circling hanging on the wall in my house. The pieces were contained by the architecture, with one seeming to lean against a door frame. 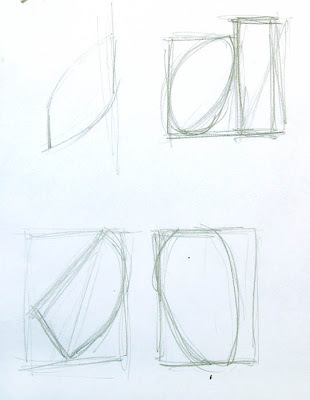 I liked the idea of a shape leaning against another, so did a few sketches and settled on the one on the upper right, though I might go back to the other ideas at another time. One thing I love about making hooked ruglets is the unexpected ways that compositions come to me; they come from painting and photography, from film, from objects around the house, and even from just doodling, making for a visual romp. I chose the colors for this piece after going through some of my colored remnants, looking for inspiration. 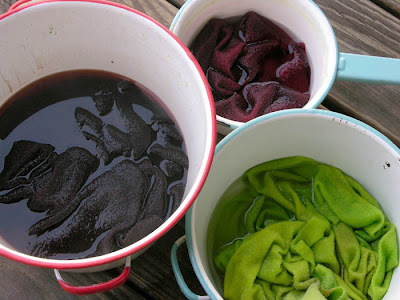 I decided to use the technique of overdyeing, using previously dyed wool and re-dyeing it. For the lime green, I started with a bright yellow (rejected from a project that needed a softer hue) and added a bit of turquoise dye; I also dropped a bits of red on it to make some variegation in the color and relate the green to the other reds in the work. For the background red, I added some darker red and some blue to a lighter colored wool; for the erect rectangle, I started with a few different pieces of red-dyed cloth. I added some dark green to it, thinking that the red/green color complement would create brown; but the red was too strong, so I added some blue, then some yellow to warm the brown. What I ended up with was a very reddish brown, a color I likely wouldn't have gotten if I had started from a white piece of cloth. I love these unexpected bonuses that come with the dyeing process. Working with this medium, which is more open-ended and playful than my painting, provides a nice counterpoint to it. 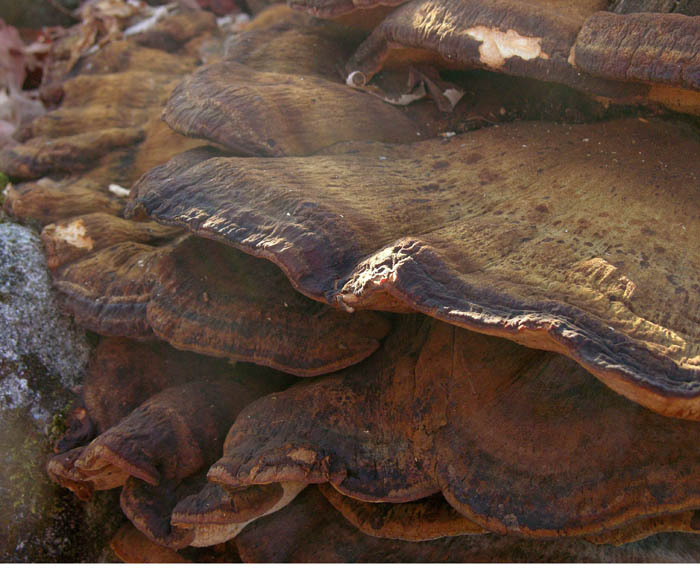 Near an old cellar hole is a large downed log, covered with hundreds, or maybe thousands of small shelf mushrooms, which I think are called Crowded Parchment (crowded indeed!). 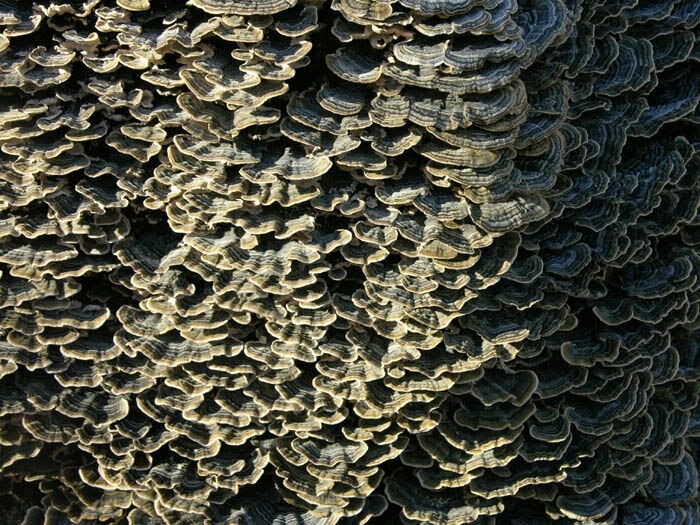 From a distance, it looks like a gaudily frilled cylinder, dressed up and ready for the ball. The images above are of the paintings I've finished since I began this blog in early August. In each, the color is very saturated and quite intense. This is by design, since I love color and tend to choose things to paint that satisfy that feeling. The farm machinery that I use as my subjects are painted in strong colors, with each company identified by specific colors: a John Deere is always bright green and yellow; a Ford tractor is blue; International, red; the Houle liquid manure spreader is a peculiar acidy blue-green; the blue and green of Green Tilt identifies it as an Ag-Bagger. Which is why I decided to work on this image next, with its muted neutral tones; I wanted a change from intense color. 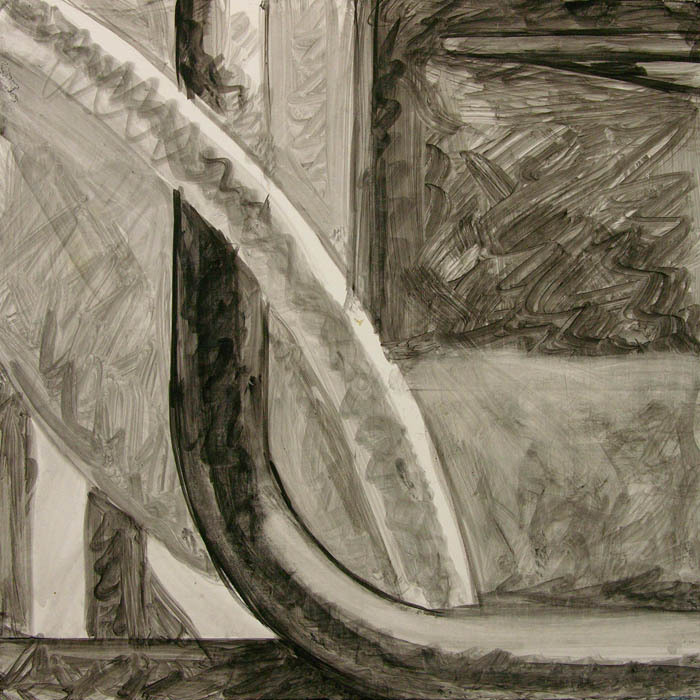 I like the warm grays against the dark blackish square, overlapped by crossing pipes of rust and translucent white. 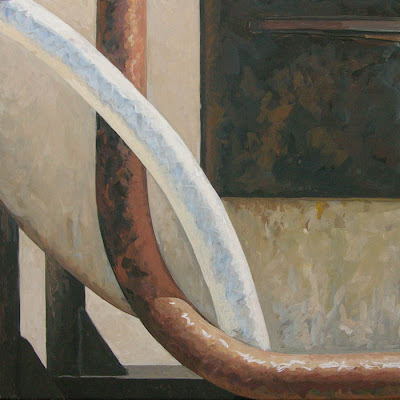 I decided the crop the image in the study, which will be a 12 inch square painting, to make a tighter composition, so that the lower edge of the rusty pipe will sit at the bottom edge of the panel; this will make for some visual fun for me as I create the illusion of a form popping forward from the window that is the picture plane. 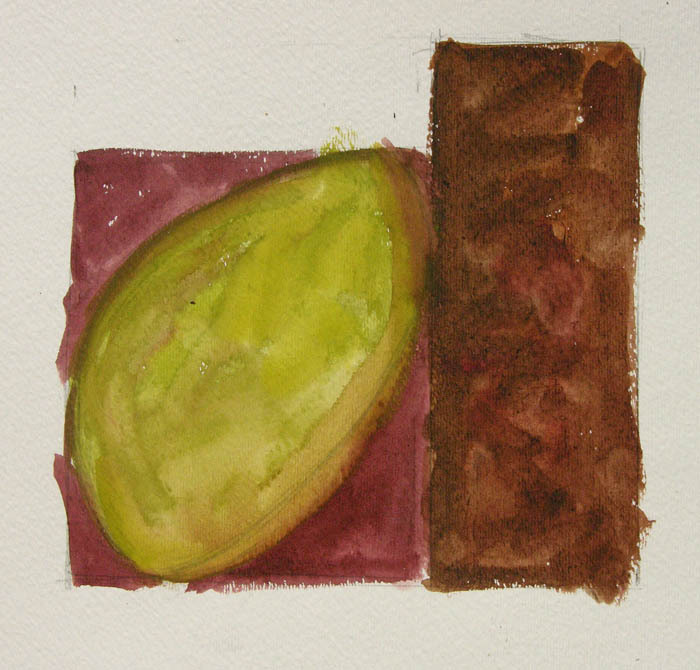 The underdrawing in ink, below, establishes a value structure for the egg tempera paint to follow. 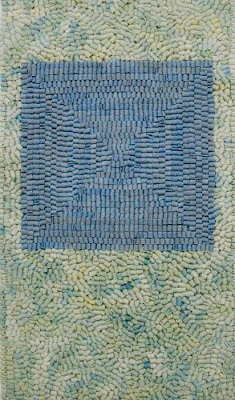 When I first put this finished work up on the wall, I felt a bit disappointed; I had deliberately used slightly different colors as backgrounds for the blue and green squares and I thought that the differences were too great; I should have had the same variegation in each piece. 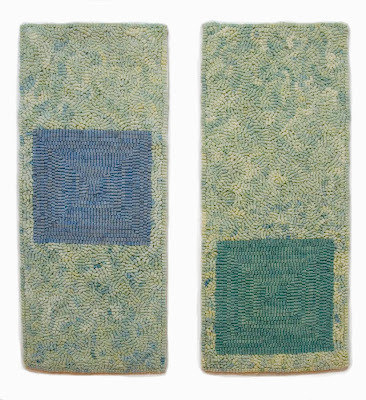 But on looking and seeing the piece better, I've come to the thought that the differences are right for the moods of each part of the diptych. The blue square, surrounded by cool, bluish toned wool, has an air of floating in evening light; the green square, which has descended to the bottom of the panel, is in a warmer yellow field, with the brightness of morning. Does the work have an Asian aesthetic, because of its inspiration? 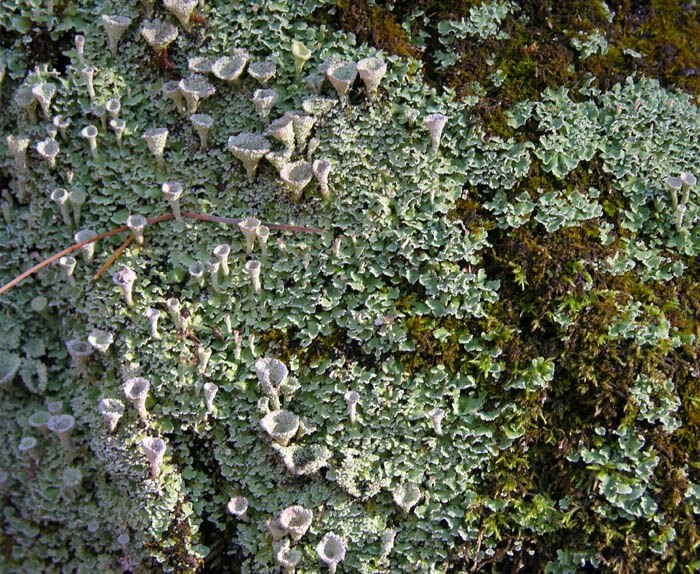 I looked up these wonderful little lichens, and found out, I think, that they're called Pixie Cup Lichen. 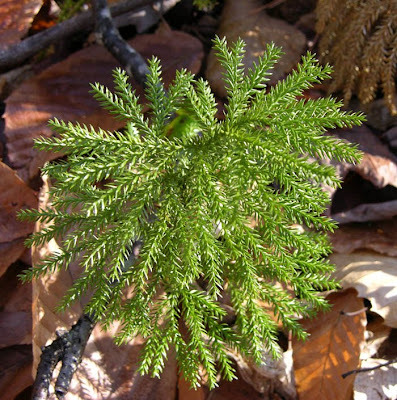 (I hope our blog naturalist, Susan, will correct me if I'm wrong.) 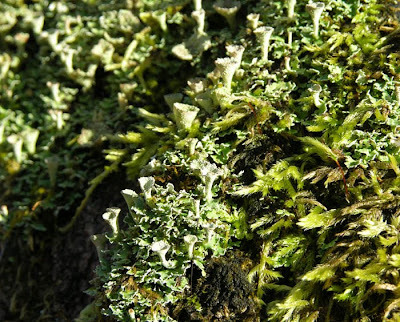 They are tiny, not more than 1/8 inch across and grow like concave toadstools among other lichens and mosses. 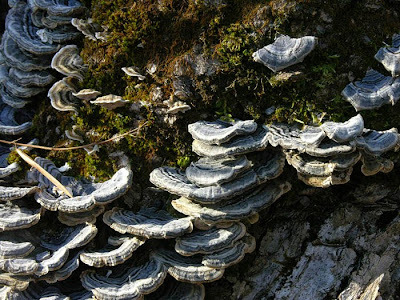 They are perfectly named, as they look as though sprites and fairies can dance among them, and drink water caught in their small bowls. 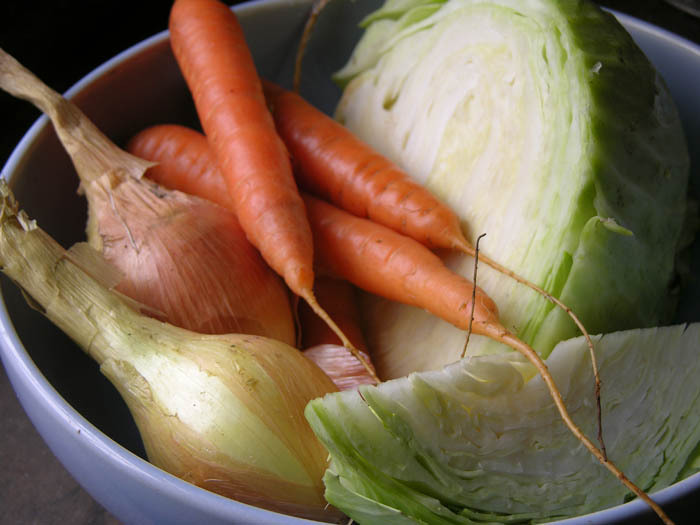 There's something very comforting about roasted foods in fall and winter; coming out of the oven, releasing a rich aroma and flecked with brown, vegetables become a heavenly meal. I love going down to the root cellar, picking out some potatoes, carrots and beets, and mixing them with onions and garlic from the cool storage room. I mix some olive oil and salt with the vegetables in the wide pan and roast in a 400 degree oven till done, an hour or more. 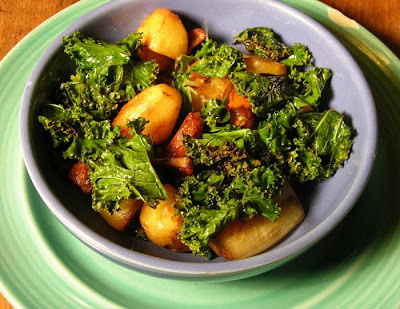 Last night, I added some kale, still growing in the garden, which I cut in large pieces and tossed with olive oil. This goes in the pan with the vegetables, at the end of cooking, for about 10 or 15 minutes, till it's slightly browned on the edges. I realize that you all know how to roast vegetables, but this post is really meant to be a paean to this humble meal. Even though I live just a few miles from the large Groton State Forest, it wasn't until this past summer that I took a walk on one of the trails there. It was a short "nature trail" and wound past remarkable boulders, enormous glacial erratics. 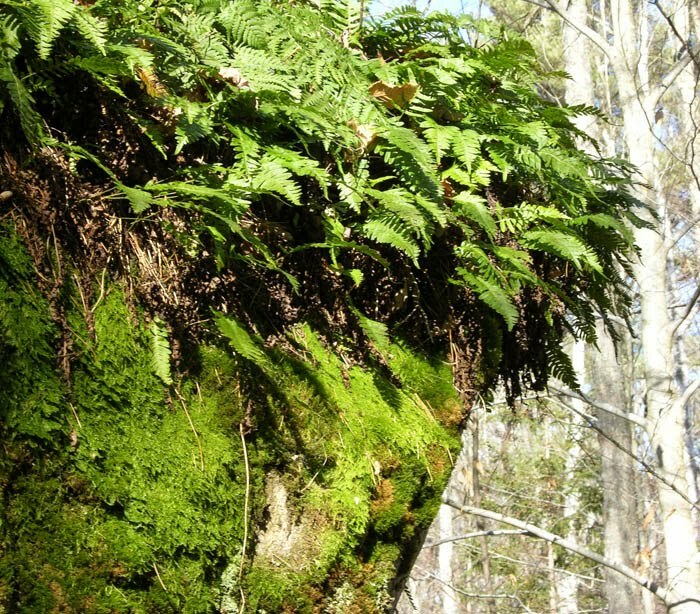 These small-cabin-sized rocks were amazing to see, and they were topped by a mass of ferns, looking like an unkempt hairdo. What a sight! The weather had been especially beautiful this week, so a couple of days ago I went back for a walk on that trail with a friend. 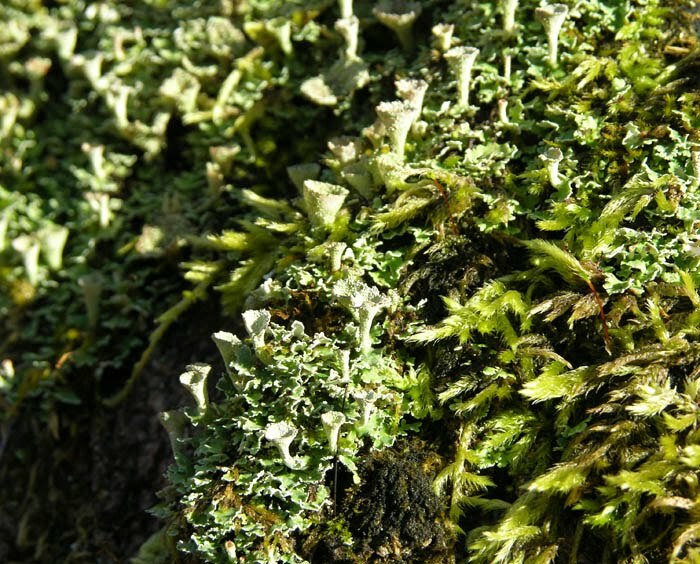 I was especially interested in seeing mosses and lichens because they've been so vivid lately. My friend told me that at this time of year, with leaves off the trees, there's more sunlight getting through to these tiny plants, so they are actively growing. 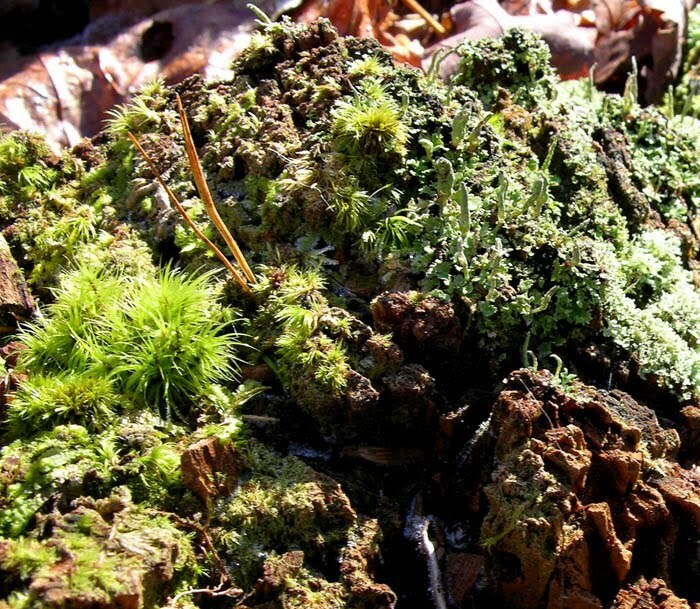 The contrast with the dull browns of dried fallen leaves makes the living green look even brighter. A surprise to me was how many of the mosses were different from the ones I see in the woods around my house; there are slight variations in habitat from place to place. 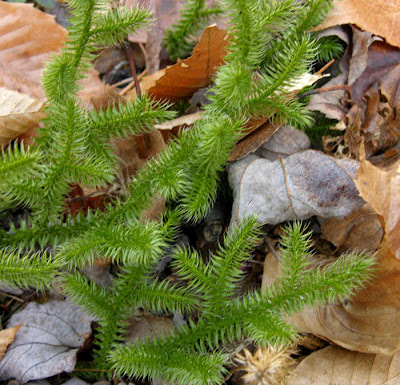 The two mosses above mimic the look of trees, Ground Pine, and Running Cedar. This was a very unusual lichen, looking like scraps of burnt paper, growing on the granite boulders. It may have a more greenish hue earlier in its lifespan. It's a kind of leaf-like lichen––foliose––but I couldn't find the exact name. 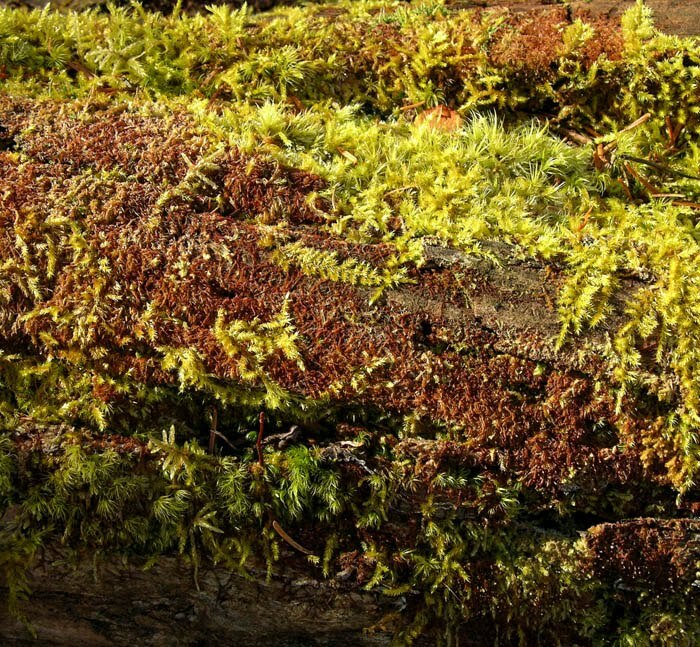 The large variety of tiny mosses and lichens invite close scrutiny; there's sheer pleasure in seeing the colors, from subtle variations of greens to contrasts of red and green. The small bit of growth on a fallen log becomes a vast landscape, a place of imagining. Working on this painting, which is now finished, has been an interesting process for me. One reason is the large role texture has in this work, which I wrote about in a previous post; another is its quality of light. I've always loved the way sunlight plays across surfaces, adding color variations and compositional elements from shadow shapes. But when I saw this motif, there was no sunlight; there was simply color, in big shapes, balanced one against the other, and I felt strongly attracted to the image. 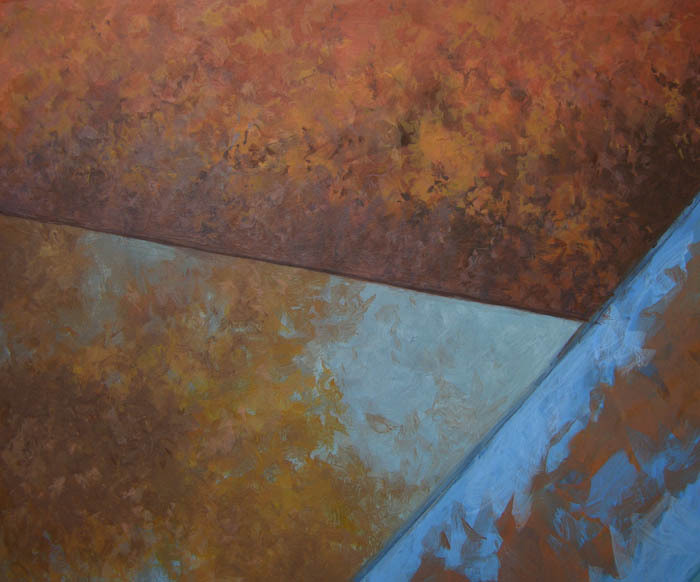 I feel that there's a believable sense of light in this work, even if not direct sunlight. Is the color more insistently itself without light and shadow? is the painting more abstract? I don't really know, but having done this painting, I'm now tempted to paint more images without brilliant light illuminating them. 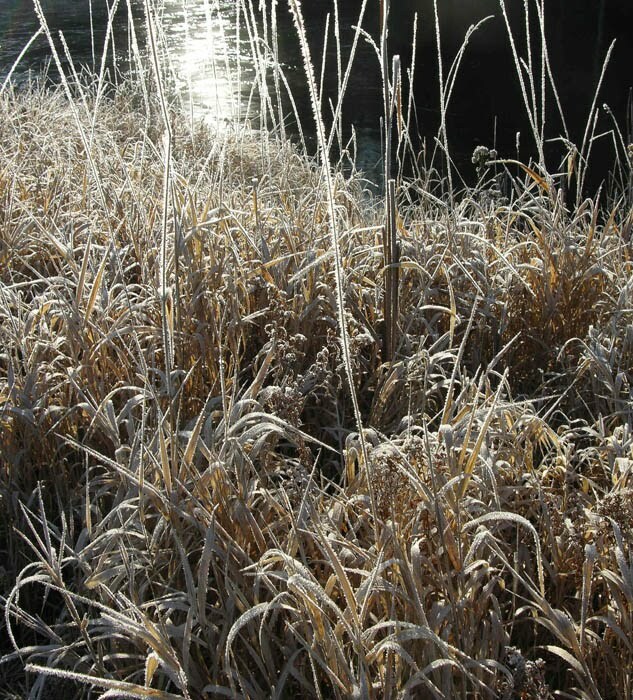 This morning I woke to a grassy landscape made shimmery by a light coating of frost. 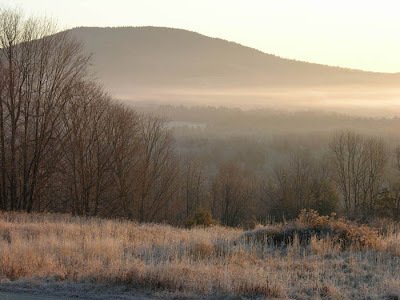 It was a perfect November daybreak, with bright slanting light and distant thin blanket of fog. I missed nothing of color in this morning, in this light. Yesterday I was feeling ready for winter, looking forward to its brisk, sharp air; this morning reminded me of its visual delights. 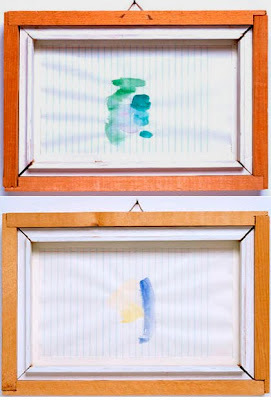 Richard Tuttle, Great Men 2 and Great Men 8, 19 October, 1982, watercolor on lined paper in wooden frame, 9.5 x 14 x 1.75 inches. I first became aware of Richard Tuttle's work when I wandered into a show of his in SoHo in the early 80s. The front room was full of watercolors similar to these: summary notations, seemingly tossed off the brush with great economy, but with a kind of perfection, like Japanese calligraphic painting. 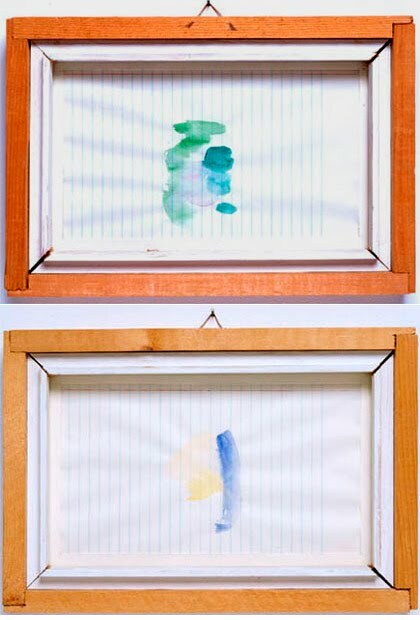 At the same time, there was a refusal to take himself too seriously; painting "Great Men" on ordinary lined paper, and framing in crude pieces of wood. 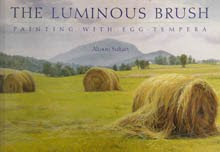 I was so taken with these works––I have to say I fell in love––that I went back to my studio, took out a stack of typing paper and watercolors, and tried to make vivid, simple little paintings. I couldn't do it; I couldn't even come close. It was a powerful lesson in how things that look effortless often need the greatest skill. 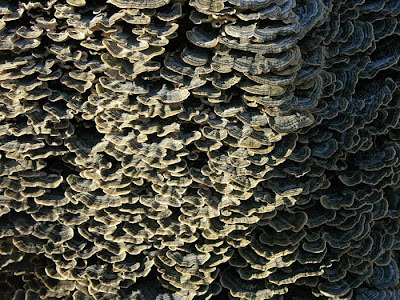 Throughout his career, Tuttle has worked with materials that say "not-art": plywood and foamcore, cardboard and wire. And aluminum foil. 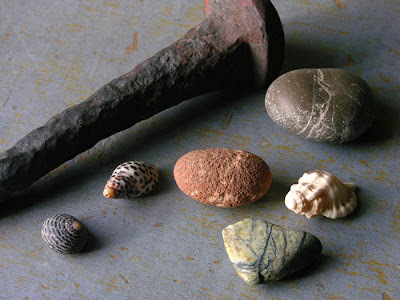 He shapes unlikely materials into endlessly inventive forms, and many are insistently small. His project pushes back against the artist-as-hero model, against Art-as-Important. 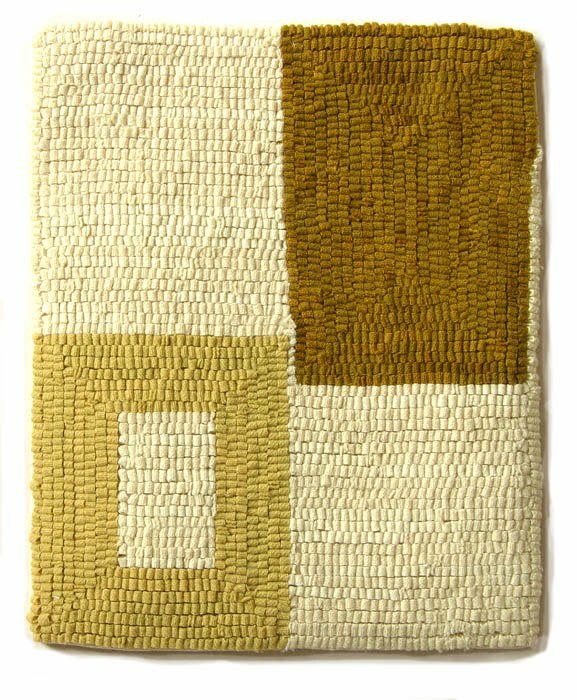 Yet the work inspires with its understated poetic resonance. 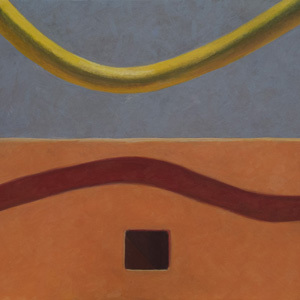 Much of Tuttle's work fits into Minimalism stylistically, but what I call "funky minimalism", where the forms are loose and the brushwork is painterly. There is geometry, but it isn't rigid. I find these paintings remarkably appealing, charming even, if charming weren't so discredited a word. They feel right. 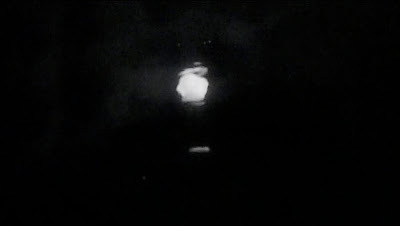 I saw the work above at a Tuttle retrospective at the Whitney Museum of Art in NYC in 2005. 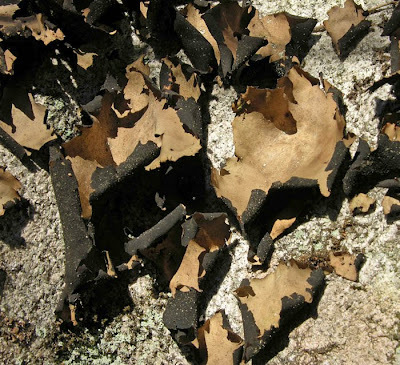 It was one of a group of shaped paintings on plywood, simple forms, all slightly off of perfect, with wavering edges and not-square corners. The show was a joy to me, buoyant and alive. (If you'd like to see more Tuttle images, you can go to his gallery's website.) 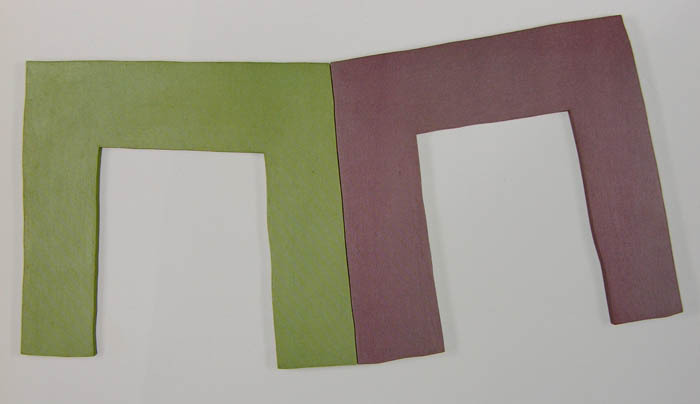 I made the ruglet below as an homage to Richard Tuttle. I had a bountiful cabbage crop this year, so will be eating lots of cabbage all winter. 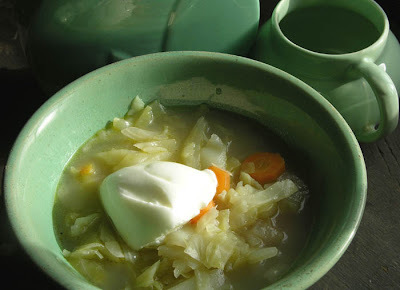 A favorite green cabbage recipe is Cabbage with Pasta, which I posted here, and another is Cabbage Soup. This is another of my simple soups, adapted from a cookbook that is long out of print. The sweetness of the cabbage is very appealing, and I feel very healthy eating it. Heat butter in a soup pot and add the onion and carrots. Cook over gently heat, covered, till the onion is translucent. Add the cabbage, water, cumin and sugar. Bring to a boil, then reduce the heat and simmer, covered till vegetables are tender, about 30 minutes. Season with salt and pepper. Serve with a dollop of yogurt or sour cream. On one of my usual woodland walks, I pass an ancient cellarhole, marking the place of a former farmstead. 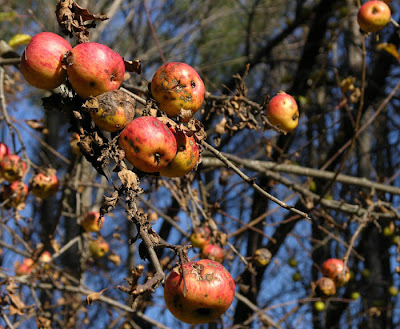 Nearby are a shallow dug well, and several apple trees. A few of the trees have what are called "winter apples", which ripen late and can be stored over the winter. As I've walked by, the apples seem to shine like bright baubles in the trees, still hanging there after leaves have fallen and turned brown. 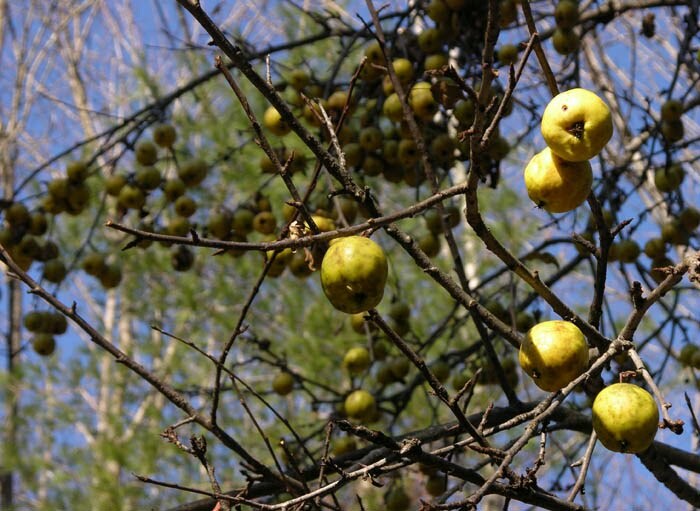 I've tried eating them, but they are hard and sour with thick skins. It's possible that they'd turn sweeter in storage, but right now they are food for deer and bear who have to fill their bellies before winter. I've finished the left side of Green Tilt, which has a great deal of texture on the surface. This is the rust that has formed over years of wear from use and weather; it's an essential aspect of the machine depicted (an Ag-Bagger), part of its physical character. I've often worried about painting these signs of wear and age, because of the danger of nostalgia. But without the texture, surfaces could be bland and uninteresting, and certainly not as much fun to paint. In order for the paint to look right to me, I have to paint many layers of color, light on top of dark, and back again, cool to warm to cool. The touch, or use of the brush, has to be the right size and have the right gesture in order to be convincing. And it all has to sit on a single plane and not look like some of the color is floating above the surface. 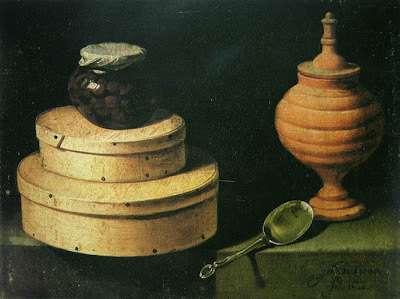 Seventeenth century Spain produced many brilliant still life painters who created dramas of ordinary foodstuffs displayed in light against deeply dark backgrounds. Van der Hamen is one of my favorite of these artists because of his simple, rigorous compositions. 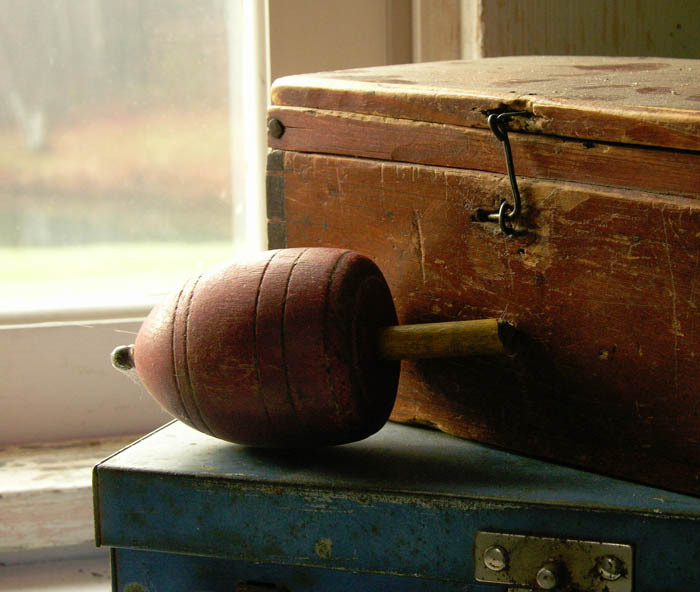 Each object has a texture that describes its nature, and is part of its volumetric form. We are not aware of the texture in itself; it is used to make each thing more tactile. For Peto also, the texture of things was necessary in describing them (see also my blog post on Peto). In their wear, they show a human-like progress through life. 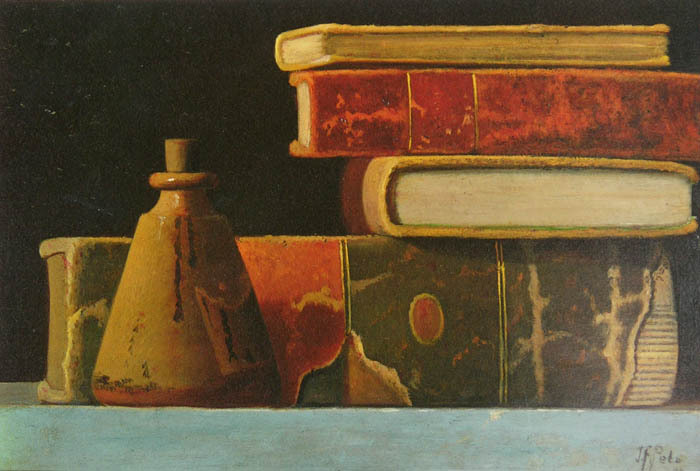 Because the compositions in Peto's paintings have a clear geometry, and the forms have simple volumes, we do not focus on the details of texture; they are deeply embedded in each object, be it book or inkwell or letter rack.